If you follow me on Facebook, you might know I spent the past two days trying to re-organize my studio. It wasn’t meant to be a big job; just assembling two small bookcases and shifting some of the books to create more space for my yarn.. because I am, as probably many of you are, a”yarn collector”! Some will say a “yarn hoarder,” but I don’t like the negative connotation which comes with the term hoarder. I simply just LOVE yarn! I love all the all aspects of yarn; I like the feeling of it, the texture if it is a hand dyed skein, I love the story behind it and the origin of the fiber. I dabbed into spinning and hand dyeing too but again there are so many talented artisans out there that make a much better job than I do, as both dyeing and spinning require a great degree of skills. My yarns are like color pencils, and that is why I love them displayed and divided by hue, fiber content, and yarn weight( 4ply,DK,chunky). You probably have spotted I have a lot of STYLECRAFT’s yarn because it is what I use mainly for my blankets. I try to stock at least one ball for each color in the main ranges I use which are: SPECIAL DK, ALPACA TWEED DK,BATIK, LIFE DK and CLASSIQUE COTTON DK. There is a gap in the library because all this ‘one blanket for each month’ makes the yarn flying out of the shelves so quickly! If I might make a suggestion, you love making blanket , you do not have a stockist near you , or, you are like me, and you get overwhelmed when visiting a yarn shop, the best way about it is to choose a brand and a weight. Then invest in one ball for each color of the range you selected as it makes the process to choose the colors for projects much easier, it streamlines your stash too. And if you have some space where to display it is a total bonus! My studio furniture is a mix of IKEA and some old vintage pieces. http://www.ikea.com/gb/en/search/?k=billy the big one is several years old, and I have been adding modules as I need them. The shelving is IKEA too and so are most of the storage boxes. 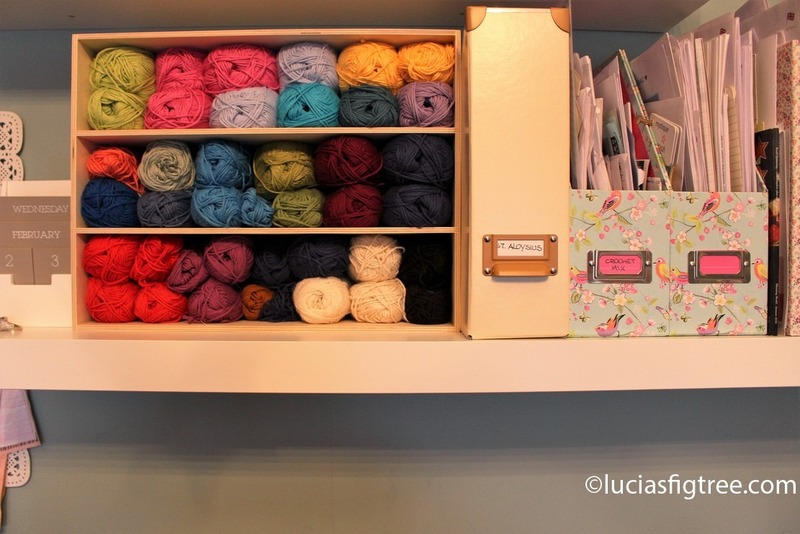 My overflow of yarn is on top of the bookcases in boxes those are DRONA boxes, http://www.ikea.com/gb/en/products/small-storage-organisers/storage-boxes-baskets/dr%C3%B6na-box-beige-art-70298813/ the retail price is £2.50 and they come in a variety of colors. I love them because they are really cheap but well done, made of fabric they are strong enough to hold the yarn and be positioned on their side. For extra strength and stability, I used some velcro tape so to join all the boxes together. They are mini chest drawers (42x18x32cm) made of solid plywood, perfect for storing cotton yarn and as books dividers too. So you can keep an eye on what you have available, no more rummaging in bags stashed all over the place and I might be bias, but I think they look pretty too! You are so lucky to have a room like that all to yourself. It’s lovely. 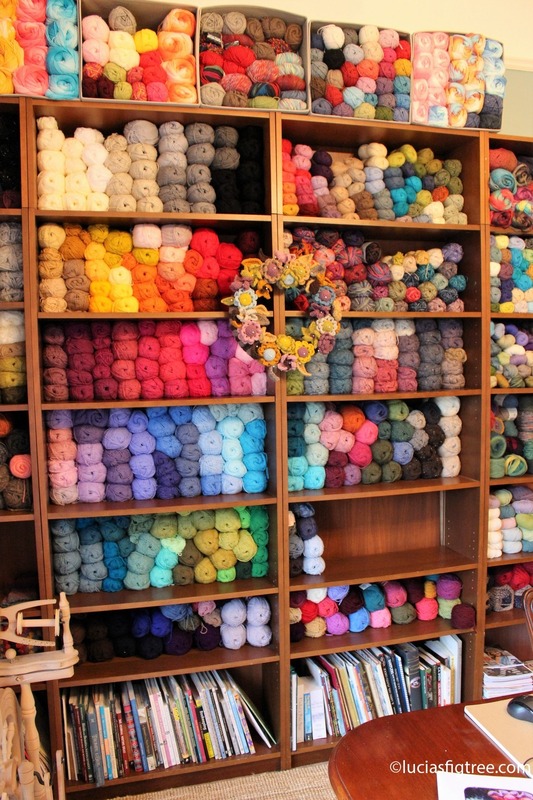 So jealous and just love your yarn room. 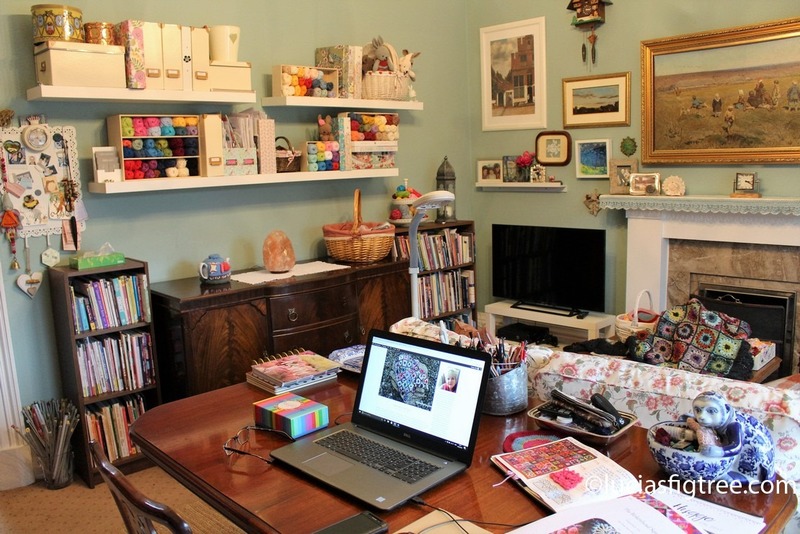 I have just started turning my home office into a craft room so thank you for the ideas. Love it. 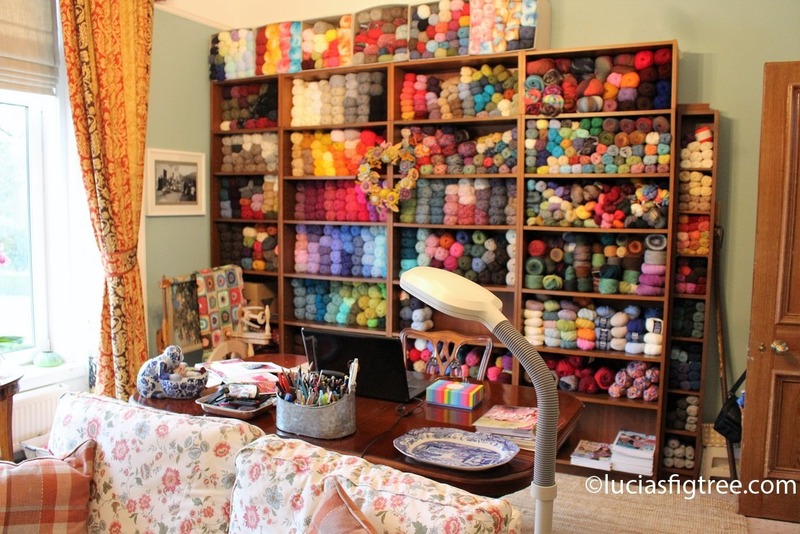 What a beautiful room, I now have ‘yarn room envy!’ I have part of a spare bedroom and a couple of large chests for my crafty stuff. One day I hope it will have its own dedicated room…a girl can dream! Thank you so much for sharing this, Lucia. 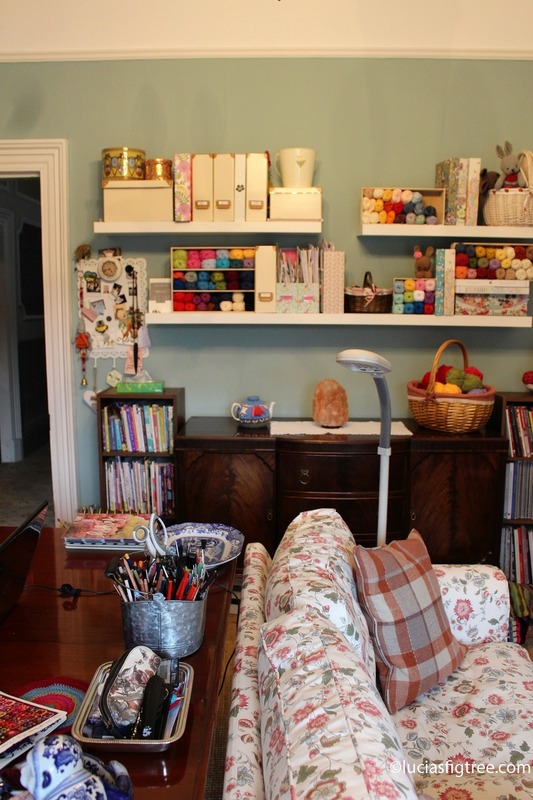 I’m hoping to organise a work room for myself soon (I’ve been wanting one for years), so really interested to see how you’ve organised yours. And I can’t wait to see the details of the Emily blanket, which looks stunning! 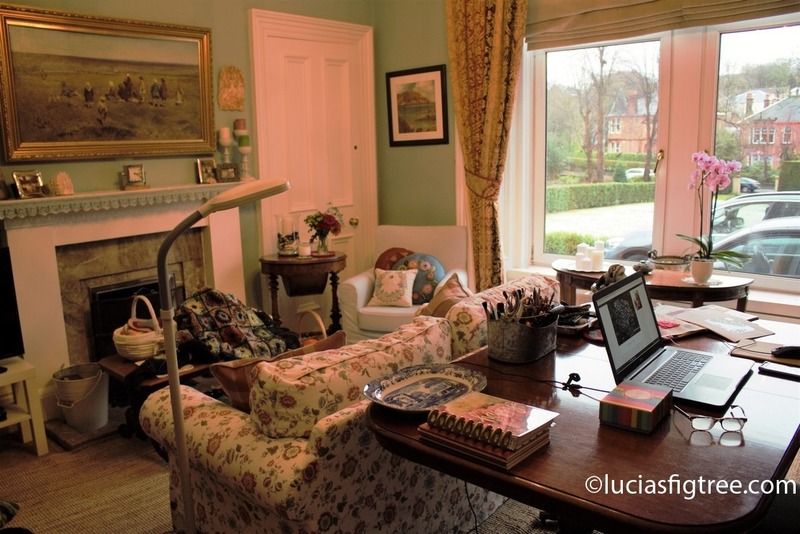 I love your room, Lucia! I could happily lose myself for days in there. It looks so cosy and comfortable, yet pretty and inspiring. 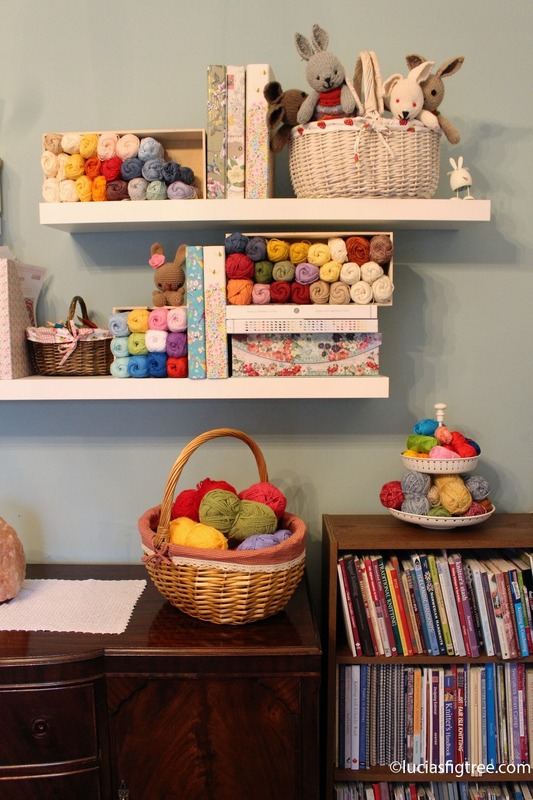 How wonderful to have all your stash on display in one place. Enjoy your space. you are welcome anytime you decide to swap the beautiful Cape with rainy Scotland! Hi I am so glad I found your website, I really found you by error, while I was researching on Aol for something else, Anyhow I am here now and would just like to say cheers for a marvelous post and a all round interesting blog (I also love the theme/design), I donít have time to look over it all at the minute but I have book-marked it and also added in your RSS feeds, so when I have time I will be back to read more, Please do keep up the great job.